Chocolate Covered Caramel Popcorn Balls: Homemade caramel popcorn balls dipped in chocolate and decorated with sprinkles. 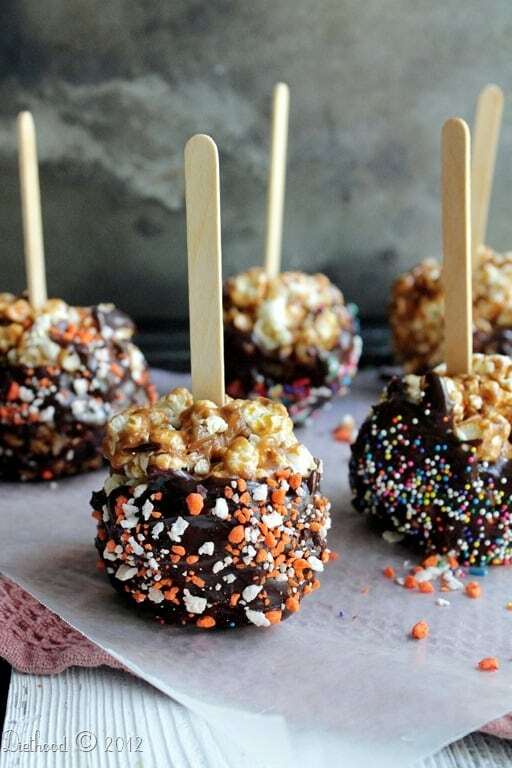 Before we start talking about caramel and popcorn and sprinkles, and Chocolate Covered Caramel Popcorn Balls, I have to tell you that I burnt the caramel. Yes, I did. I looked away for a second or two to take out the heavy cream (I forgot to take it out beforehand) and bam! Burnt! I was so upset with myself and not because I burnt it, but more because I wasted two sticks of butter and couple cups of sugar. I had so many plans for that darn caramel, but I guess it was meant for the garbage disposal. And because I was so frustrated, I didn’t even bother to make another batch. I went straight for the Brach’s caramel candies that were sitting in my pantry. I unwrapped them one by one, mixed in some butter, and there it was; Caramel a la pronto! So you’d think that a 3 year-old would be the most excited about eating these fun treats. No, Ana was more excited about dipping the popcorn balls into the chocolate and sprinkles. The one that was most excited about eating these was my father. He called to see what I was up to, and after I told him my sob story about the caramel, I let him know about what was cookin’. He asked me to save him one or two. Later that night he had four balls of caramel popcorn; he said it reminded him of his youth. Couple of notes about making these. 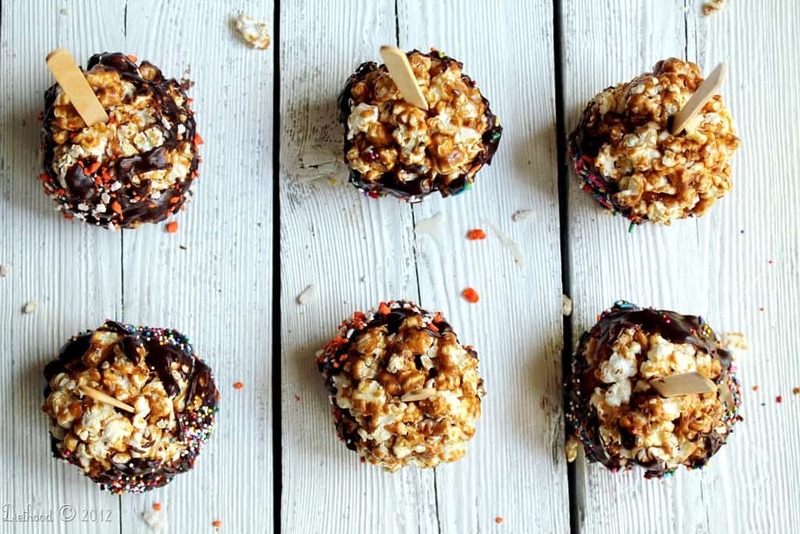 14 cups of popcorn may sound like a lot, but it’s not. It only makes about 10 balls of popcorn. By the way, 14 cups of popped popcorn is about 1 cup, or a tad bit more of unpopped popcorn. Also, don’t let the caramel cool too much before shaping the popcorn. Stir the caramel in until all the popcorn is covered and let it sit for about a minute or two to cool before you start working with it. Please make sure your hands are buttered before you start; keep a dish with some butter next to you and butter your hands before shaping each ball. Place the popped popcorn in a large bowl. Set aside. Put the unwrapped caramel candies and butter in a medium-sized saucepan; cook over medium-low heat and stir until melted and smooth. Remove from heat and pour over popcorn. Mix until all the popcorn is well coated. Let stand for a couple of minutes to cool. In the meantime prepare your chocolate chips by melting them either in the microwave or over a double broiler. Melt until smooth. Grease your hands with butter and shape the popcorn into the size of a softball. 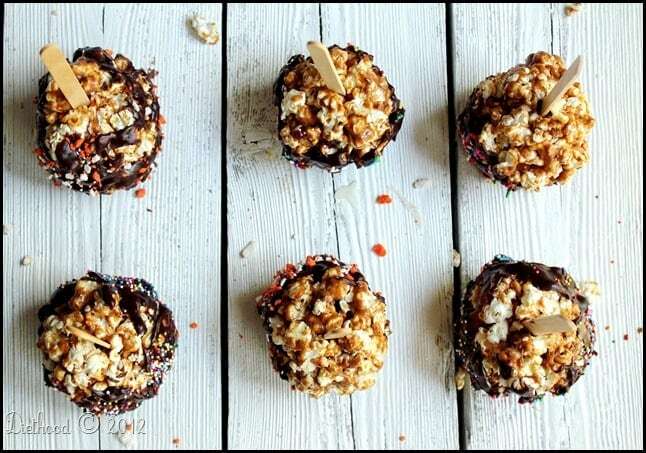 Stick a popsicle stick in each popcorn ball and dip each popcorn ball into melted chocolate, then roll in sprinkles. Hi! 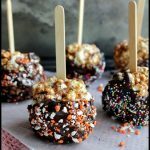 I just made these and would like to know if I should refrigerate them or not? I’m giving them out tomorrow as treats and I don’t want them to get soggy! You can store the popcorn balls in an air tight container and they shouldn’t get soggy. But putting them in the fridge is also a great idea. I hope that helps! Yummy and perfect for our carnival party! How far in advance would you say these could be made? Would I need to refrigerate them? 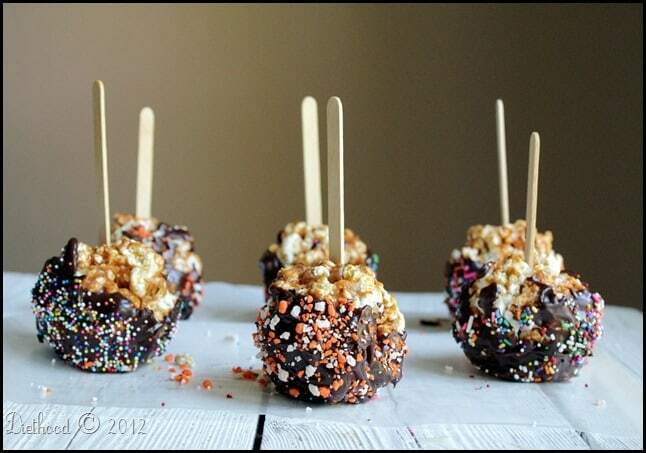 Birthday party is on a Saturday, so I was thinking of making them on Thursday or Friday…thoughts? Thanks! Rebecca, did you get my email response? I hope so!! I have the same question, I’d like to know how many days ahead I could make these. Thanks! Hi Emily! Up to 2 days ahead. After that, the popcorn tastes soggy. This is amazing! I want 5 right now! 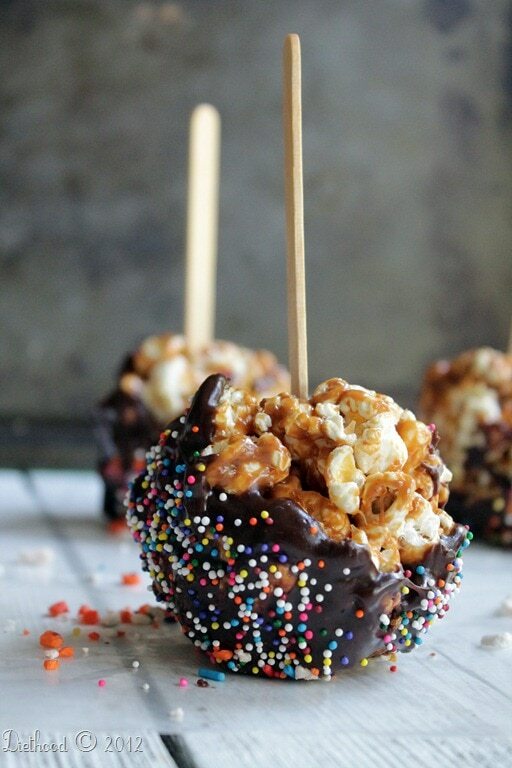 It only takes a couple of seconds to burn caramel! And how funny that your dad loved these the most. I love it! That’s usually how it goes in our family….the most unsuspecting people love things the most. Great treats! Thanks for sharing!! Tiffany would go banana if I let her dip in chocolate and of course have sprinkles all over the house. I’m with your father! I’d eat AT LEAST four of these! What a delicious treat and your save with the pantry caramels was ingenious! I know how you feel when something fails. Like you, I’m more concerned about the waste than the mistake. 🙂 Great save! 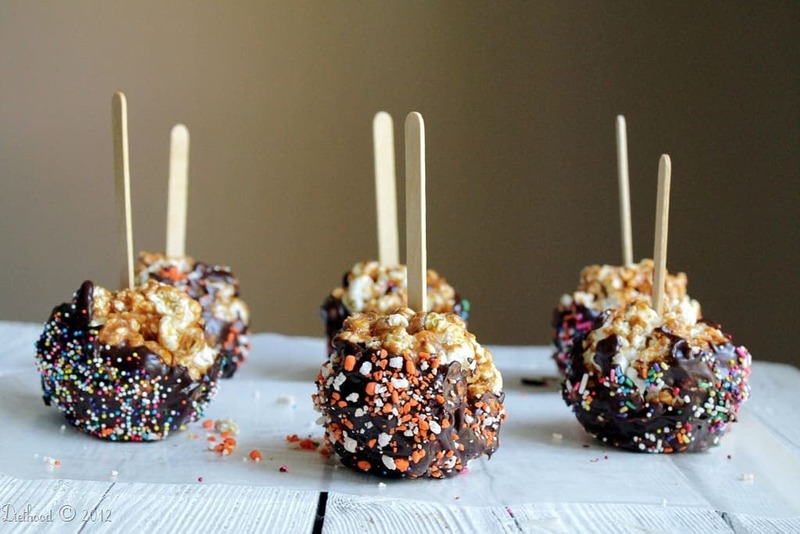 wow these popcorn balls look AWESOME! Way to improvise on the caramel! I think we all have days like that…. These look delicious by the way!